In painting, an assurance of technique is one thing, the actual depth of insight another. Happily, the two go together in the paintings of Ying Li, whose thick, turgid brushstrokes and heightened colors belie a surprising sensitivity to the visual character of her subjects. The subject of her two dozen paintings currently at the Gallery of the College of Staten Island is the dramatic landscape of Switzerland, where the artist spent several weeks last summer. Gallery-goers familiar with Li’s work will be unsurprised by the ferocity of her approach. But if her attack never dallies, the resonance of her forms lingers. “Ascona, Fog #2” (2013) catches the absoluteness with which bar of greenish-black locates the ground plane, setting off — across a brief interval of lighter green — the distant compactness of a tree. 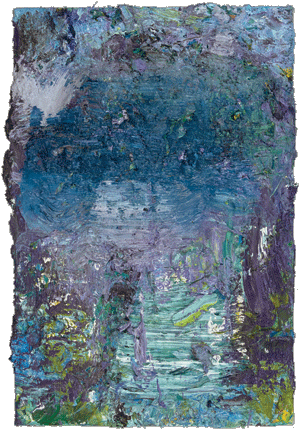 In “Ascona, Rain” (2013), a few, raw planes of color establish the dark, overhanging mass of a cloud, at once feathery and weighty, above the luminous sheen of a lake; the air in-between becomes mysteriously, radiantly airy. Such canvases impress for their no-holds-barred technique, but they compel even more for what’s beneath: a discipline of form and color that re-makes the dramas of nature as only painting can.